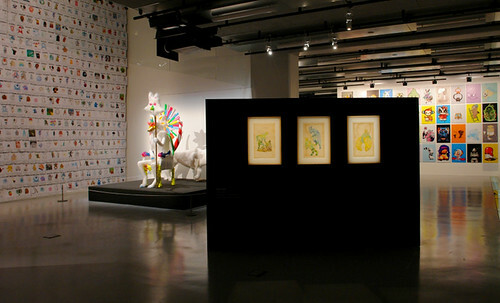 Here are some nice photos of our Hobomuck and Moonhare illustrations from the Post Digital Monsters group exhibition we were in last month at La Gaîté Lyrique in Paris. The exhibition was apparently a great success and we are very grateful to have been a part of it! Our work is now off to Berlin to be part of the Pictoplasma goings-on in April. All through the month of December some of our illustrations will be showing at La Gaîté Lyrique, Paris, in the group exhibition Post Digital Monsters and as part of the Pictoplasma extravaganza taking place throughout the city. The exhibition opening is December 7th and the exhibition ends December 31st. It is going to be great! And the gallery is new and really amazing and has been doing a lot of interesting shows. Plus the people we are showing with are super talented folks (Friends with You, Shoboshobo, etc.) and we are incredibly honored to be invited to show with them! If you are anywhere in the Paris area in December swing by and take a look! 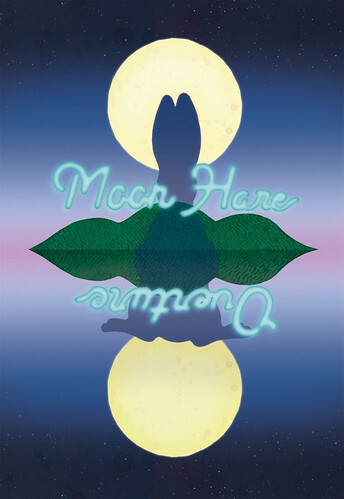 Oh, and the illustrations are taken from our MoonHare story set that we took with us on the Oneiric Caravan tour in Japan last summer. We'll be writing about them soon enough! DOTMOV has added a number of international locations to its traveling festival! Check out all the dates and additional info here! Currently the videos are screening in Stockholm but they'll be in L.A. (NORBERTELLEN GALLERY), Buenos Aires (G104), São Paulo (Arte.mov 2010), New York (Ward Nasse Gallery) and Kuala Lumpur (KLDW2011), while continuing at various locations in Japan. We'll certainly be going to the New York screening in February! I meant to write on this MUCH earlier... but our MoonHare Exhibition does not wrap up completely when we are done at Gallery Blue Ballen next Friday (8/6). We will be showing briefly at two very nice locations in Tokyo in September! 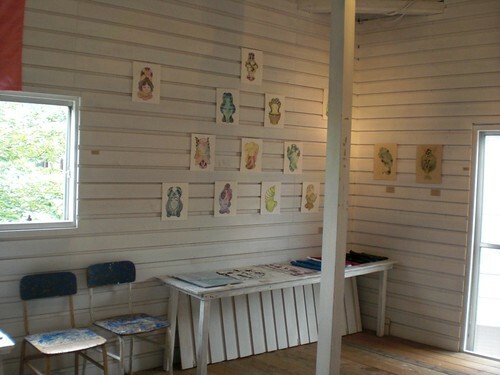 First is at VACANT in Harajuku, a lovely gallery, zine, event space and vegan cafe! We will show there from August 31st to September 5th with an amazing music event on the 4th where we will be doing live artwork (more on this tomorrow)! The next starts soon after on September 7th and continues for the week until the 12th at STONE in Kichijoji a beautiful cafe/bar and gallery space. 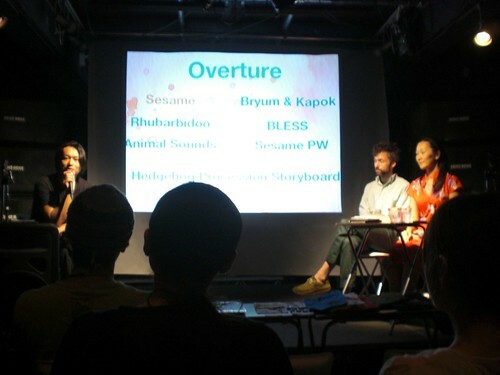 On our final day there as well will be another musical event where we will be performing Storytellers with Takeo Toyama! After being nominated for the Swatch Young Illustrators Award 2009 at the Illustrative festival in Berlin last year, we were asked by the folks at Illustrative to participate in the 100 year anniversary of automaker, Alfa Romeo, occurring in the spring of this year. Working with archived racing photos and various automobile and logo designs from the company, we created an illustration which is now up on the Alfa Romeo Art site available as a print of various sizes and qualities. Details on a future exhibition with the pieces coming soon! The opening on Friday went really well! A lot of people showed up for the benefit show where Kurt & Chris Weisman and Ruth Garbus played their lovely music and even our good friend Ryan Storm joined in on his drum (although we missed that part!). Nick Sarfaty-Jackson also seemed to do quite well that evening selling his earrings. Below are some photos from the show...well, from the hanging Thursday night, so you get a sense of the space and the work but none of the people and music and earrings (between the pizza, talking, tea and music we forgot to take any pictures!). 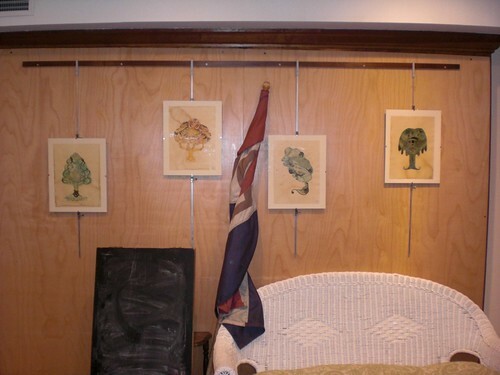 The work this time is a small selection from the past two years with some pieces (the coffee stained zodiac watercolors) from previous shows and others old to us but new to the local public. The new year is already building up steam! On the 8th of January a two month Overture exhibition will start at the wonderful Elliot St. Cafe in Brattleboro, Vermont! The exhibition will run for two months and open with the town's first gallery walk of the year. The second gallery walk (February) we are planning on screening a selection of our animations including the upcoming KiraKira video. 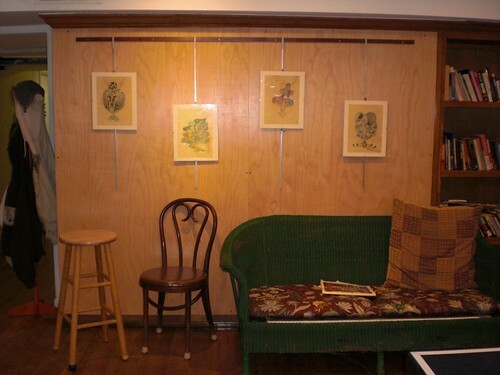 Here's a poor shot of our piece in the Creatures & Monsters group show at Through the Music Gallery in Brattleboro, VT we spoke of last week. Below is the original drawing. For the show we cut it up and mounted it on plexiglass we spray painted the back of black. It sort of looks like the three deceased are floating. The show goes until the 25th! The image above has all the info, but there's a monster-themed group show opening this coming Friday at Through the Music Gallery (where we've shown at before) and we have one new piece that will be taking part. The opening reception is from 5:30 - 9:00 PM on Friday, November 6th! 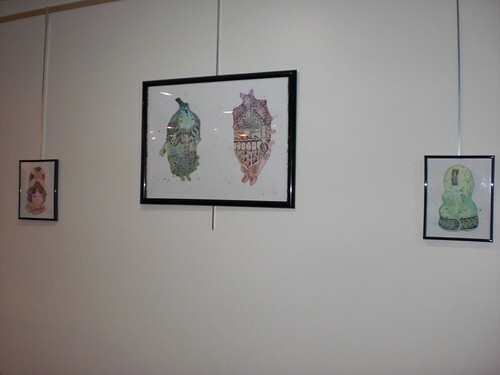 We'll also have photos up of the new piece after the exhibition is under way. This Saturday, July 11th, at Pink Hobo Gallery in Minnneapolis, is the opening for "The Art of Yo Gabba Gabba!" 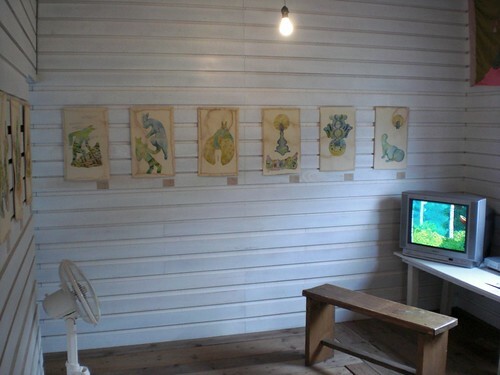 an exhibition of concept designs, stills and other related artwork for the television show. There will also be artwork by artists who have contributed to the show - which means some of our work will be there as well! The opening starts at 5pm and the exhibition is currently running until August 1st. We are hoping to have some goods available for the opening, so if you are in the area on Saturday evening, stop by! We're participating in PHOBIA EXHIBITION, a group exhibition next month put together by MOYTOY at Gallery 101 in Kaunas, Lithuania! 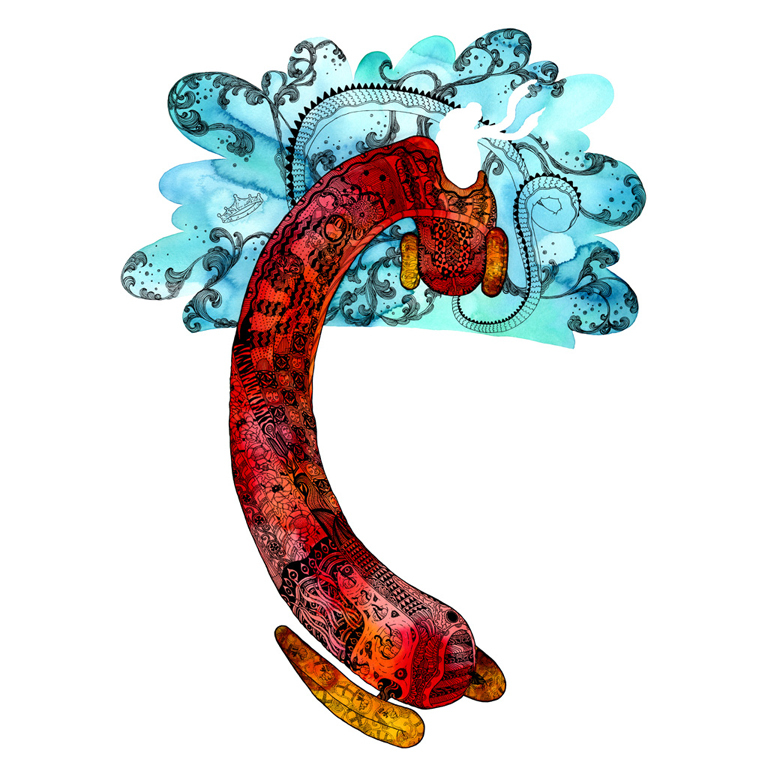 Above is the illustration we created for the exhibition. Participating artists were asked to select a phobia and express it how they saw fit. We chose "lachanophobia", fear of vegetables. The exhibition runs from June 5th to 20th and there is an opening party on the 5th from 5PM. It's been a while since we were in any kind of exhibition so it is pretty exciting! Bryum & Kapok, in its three part entirety, will be screening at the festival/conference/exhibition that is Pictoplasma's Pictopia in Berlin this March. Specifically, it will screen as part of the "Psychedelic Midnight Mix" from 10:30 P.M. to 12: A.M. on March 20th, the second day of the conference. Also, please explore around on the Pictoplasma website to learn more about the many many wonderful things these Berlin-based folks do for the characters of the world. We will have a piece in the “Greetings from ________” Postcard Exhibition at the Sunshine Studio in Tokyo. The show's opening is Saturday Sept. 6th. You can check other postcards (our's will be up when it arrives) at this blog. The wine label exhibition we're participating in has begun. For details (in Japanese), and photos check out the three CHUBBY blog links above. 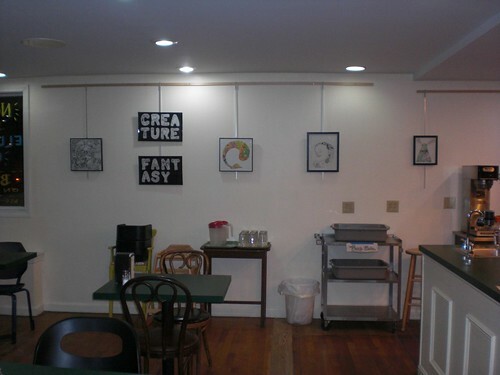 New portfolio of the Caffeine Exhibition is available now! In this show we are focusing on twelve new works using watercolor and ink and soaked in coffee - in mind of the particular venue. We're participating in an interesting group exhibition next month in Tokyo at the cafe, CHUBBY's in Daitabashi and the bar, VinSanto in Ebisu. The exhibition is also sort of a competition. All twenty-four participating artists were asked to design wine labels, a red and a white, which will be the art displayed in the exhibition. The designs will also be printed and stuck on actual wine bottles to be sold at the two venues. At the end of the exhibition, whichever design sells the most receives a prize and a pat on the back. Unfortunately we can't attend, even if we get the pat on the back, but we're hoping friends will pop in and get drunk off the wine with our designs. The bottles are going for 1000 yen...which is very cheap. CHUBBY's will be holding the exhibition from June eighteenth to July fourteenth, displaying the white labels with an opening party on June twenty-second from 5:00 - 10:00 PM. 2000 yen to get in including one drink and food. VinSanto will be holding the exhibition from June twenty-third to July twentieth, displaying the red labels and holding the closing party on July twentieth from 5:00 - 10:00 PM. Same situation with the door charge. Addresses and contact info for CHUBBY's and VinSanto's are at the very bottom - and our designs for the show are just below! Tomorrow is the opening for our six week show at Mocha Maya's. It's going to be a very easy going affair and we are looking forward to it. We've been caught up in so many big projects lately it's great to have something as fun and laid back as this. Below are some shots of the new pieces we did for the show. The rest we already put up in flickr. We were considering uploading each image over a longer period...but we just couldn't wait.